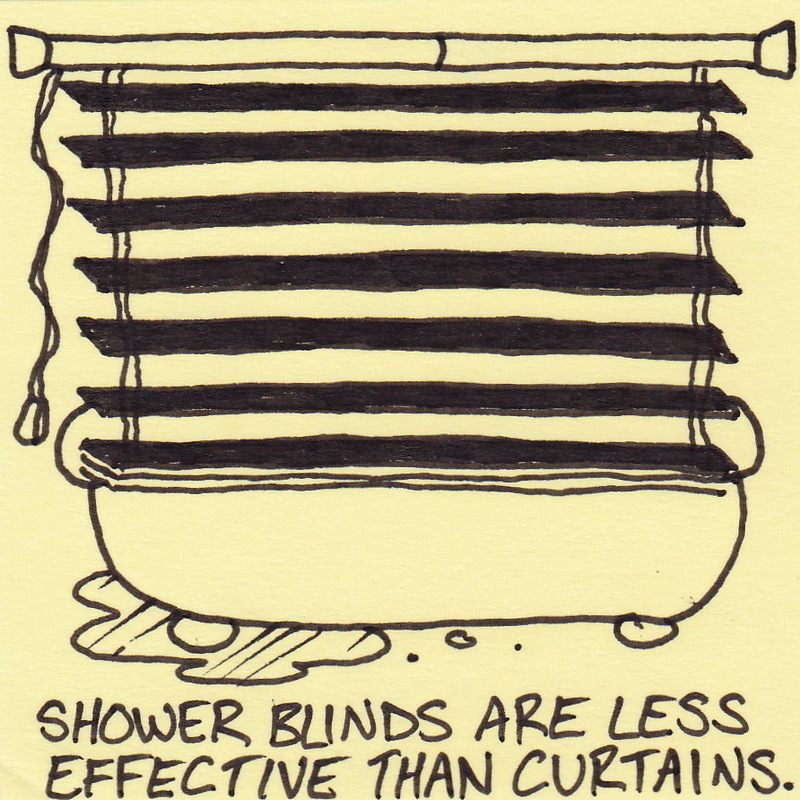 Shower curtains vs. shower blinds. 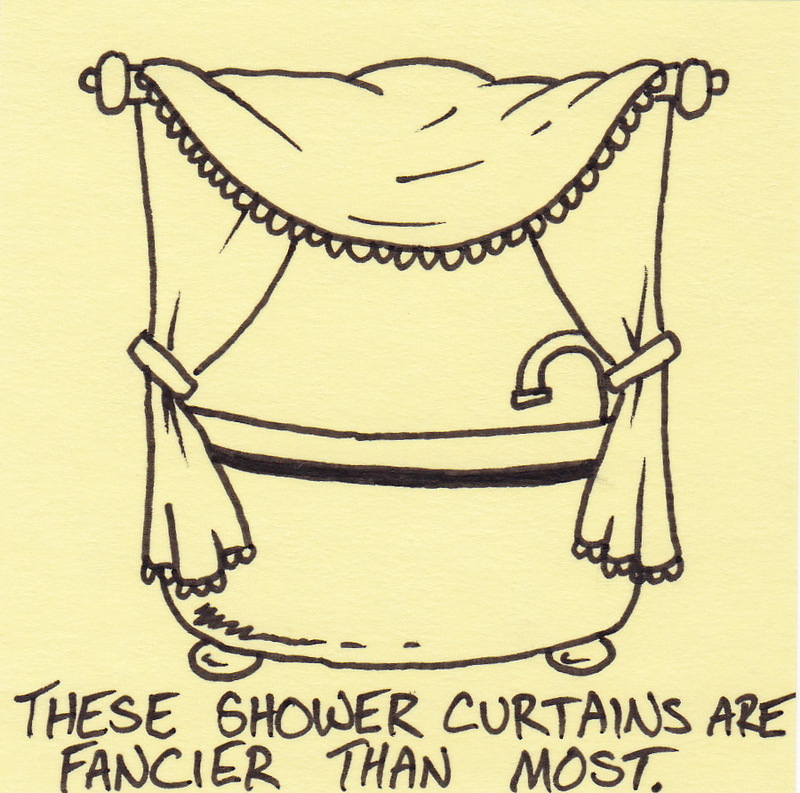 I drew both of the above cartoons on the same day several months ago. 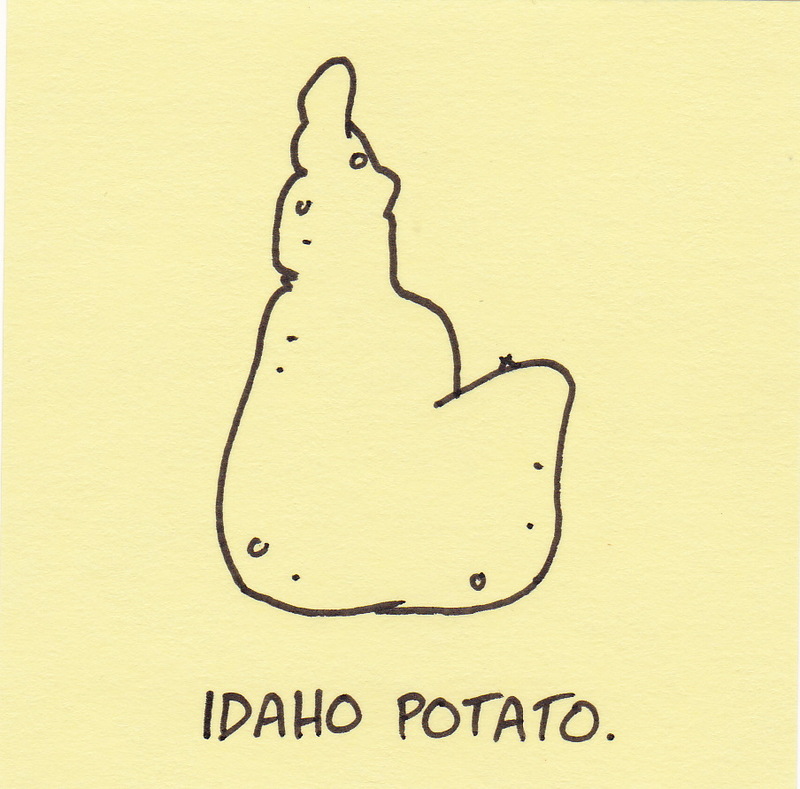 I usually show all these little drawings to my wife before I post them. Usually we agree on what is funny and what isn’t. In this case we disagreed completely. I liked one and she the other. So, without telling you which sketch each of us preferred, I am asking for an impartial third (and fourth, and fifth, and sixth…) opinion. Which is the funnier cartoon? 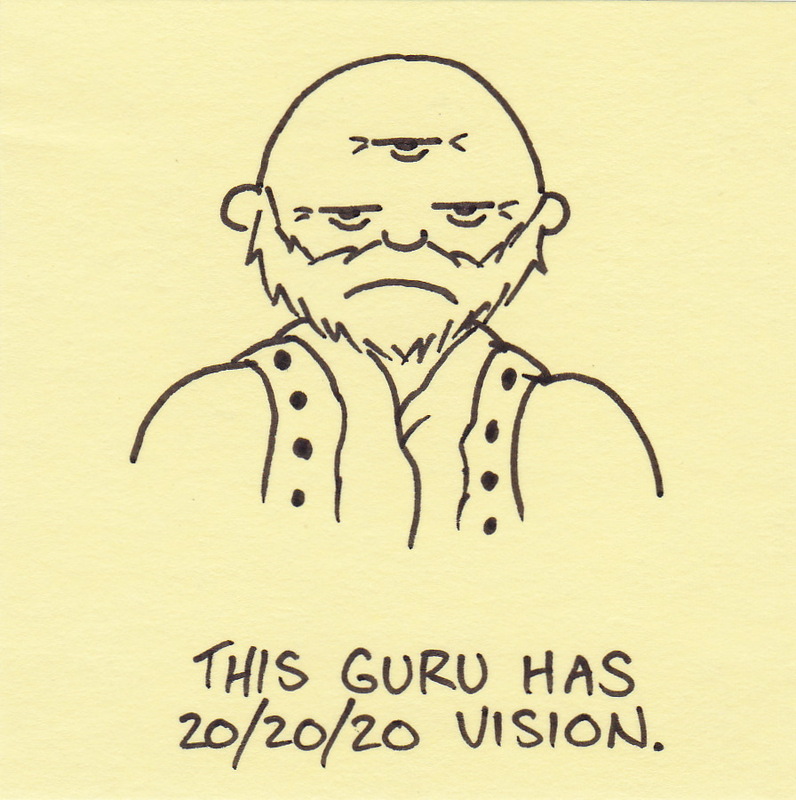 This guru has 20/20/20 vision. The internet is full of information. Last year, a co-worker was describing a man that I was unsure if I had met or not. I suggested we try a Google search. It was impressive. By simply searching for the man’s name and the small town we live in, we immediately found all kinds of information. We found a page that described his status as a guru. We found a page that listed his credentials as a yoga instructor. The more links we clicked, the more information we learned. Then it happened. We found a page detailing this same man’s colon cleansing techniques. The internet is full of too much information. Question of the day: does this comic makes any sense to anyone outside the U.S.? 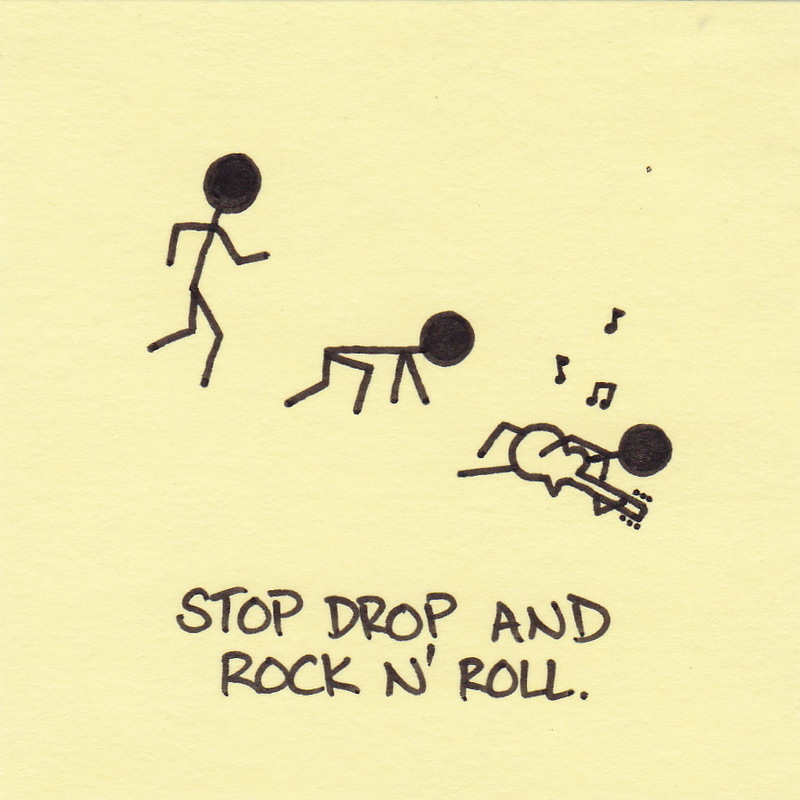 Stop, drop, and rock n’ roll. 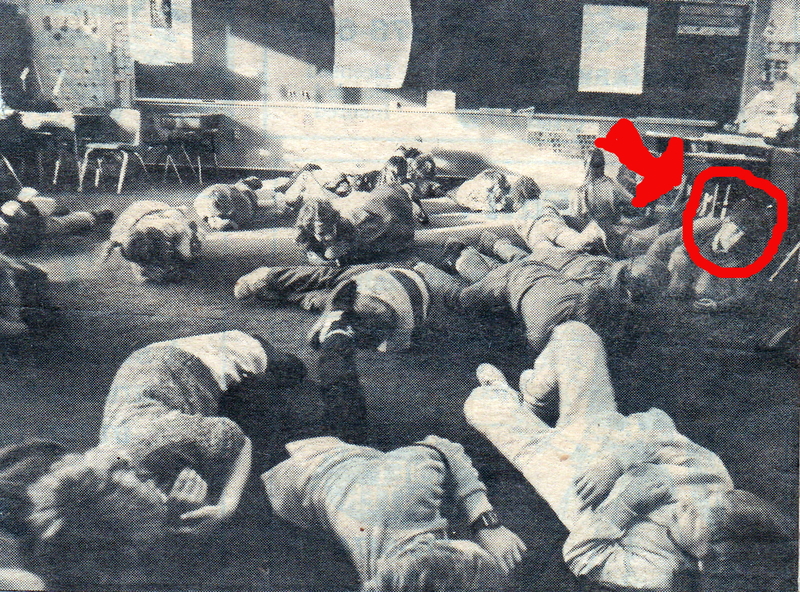 When I was in third grade, a reporter from the local newspaper came to photograph our class practicing how to “Stop, Drop, and Roll.” I remember it was a big deal for our class to be chosen. When the signal was given everyone got right to work – rigorously rolling back and forth to extinguish the imaginary flames. I was less concerned with safety protocols and more with the chance to see myself in the paper. I stand by that decision. Twenty-five years later I’m the only person who can still pick himself out from the crowd of rolling third graders. This week my Grandfather (Dad’s Dad) passed away. 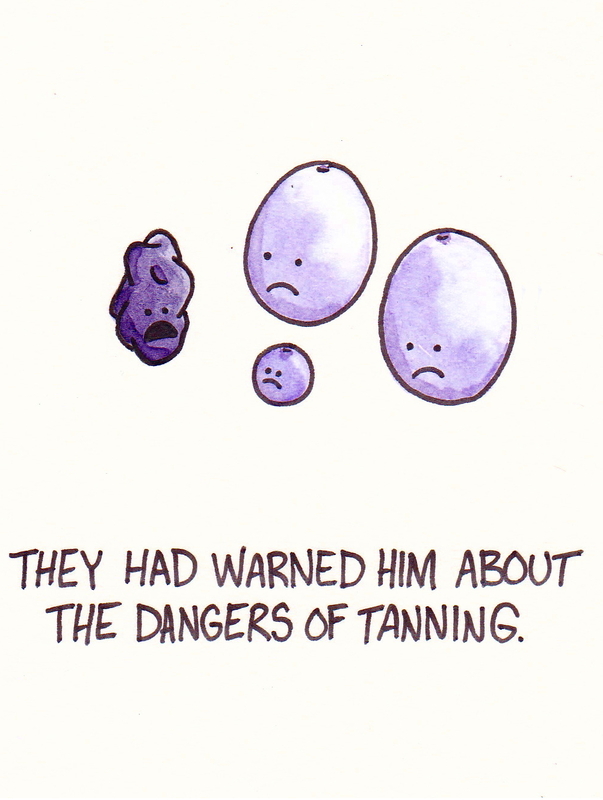 He was raised in a coal mining town in Pennsylvania. Like most of his generation, he fought in WWII. The stories he told about his time in France were especially fascinating. One of my favorites was about a time that he and two other men were separated from their unit in France. They had a jeep and were driving frantically through some back country roads searching for any friendly forces. As they drove through one small village they were swamped by a growing crowd that eventually pulled them from their jeep. The people of this particular village thought that they were being liberated by the three lost Americans. My Grandfather said that there was dancing, speeches, and an even an impromptu parade in their honor. As none of the Americans spoke French and none of the villagers spoke English, they had to stay until the crowd thinned enough that they could drive on. After WWII he came back to the states and found a job as a stock boy for Hallmark Cards. He worked hard and managed to earn promotion after promotion in the company. When he retired from the company in the 80’s he had earned the title of Vice President. It isn’t often that someone moves from the lowest to one of the highest positions in a Fortune 500 corporation. Not bad for a coal town kid with no formal education. 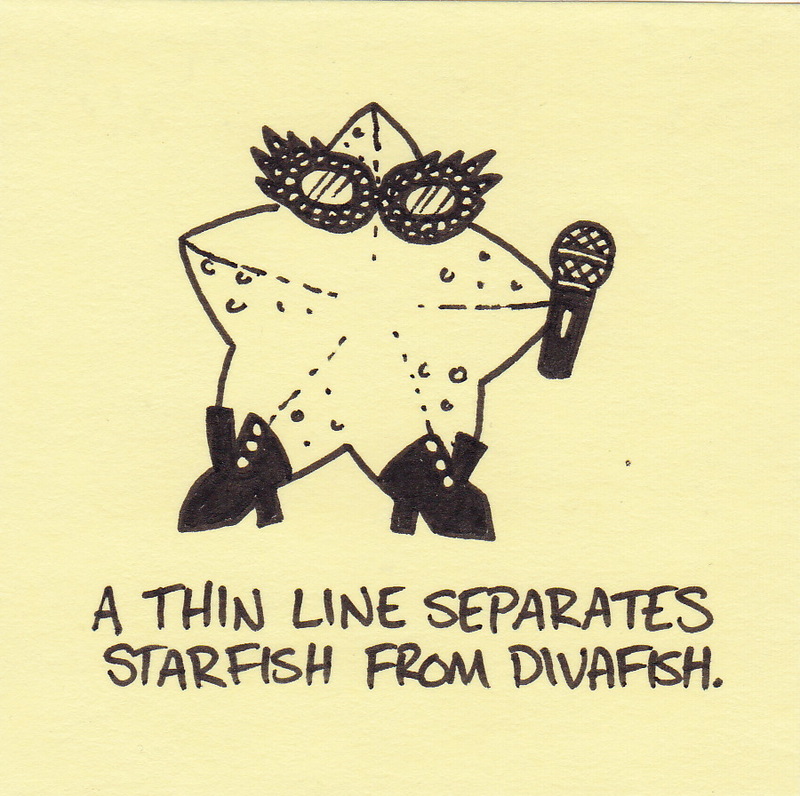 A thin line separates starfish and divafish. Those who use images and link/credit this blog. They include: one article about possible connections between diet soda and strokes, a slideshow for advertising and marketing types, a piece about Scottish culture, and a surprising number of blogs and tumblr pages. Those who ask for permission for use in offline purposes. These have included some unusual things like a newsletter for a small nail exporting company or t-shirts for an ultimate frisbee team. Those who take my drawings and sell them as their own work. I feel a bit like a diva to complain… but seriously?! I’m not sure which surprises me more – that some people are so quick to take credit for another person’s efforts or that my drawings can actually make a buck. It feels a bit “diva-ish” to actually state this, but… you are welcome to share the images on the wordpress page as long as you link or give credit when doing so. Furthermore, if you are wishing to use these cartoons for profit – don’t. It’s not allowed and it’s not very nice either. 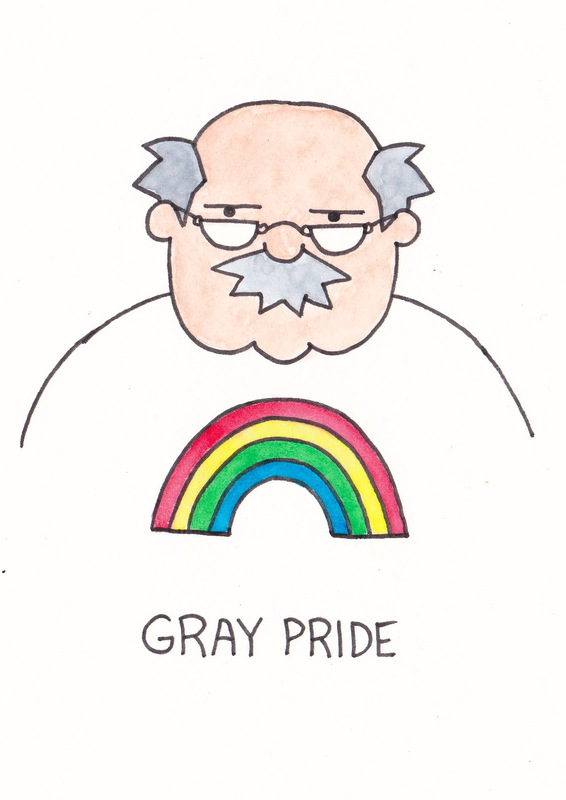 You are currently browsing the Inkjot blog archives for September, 2011.